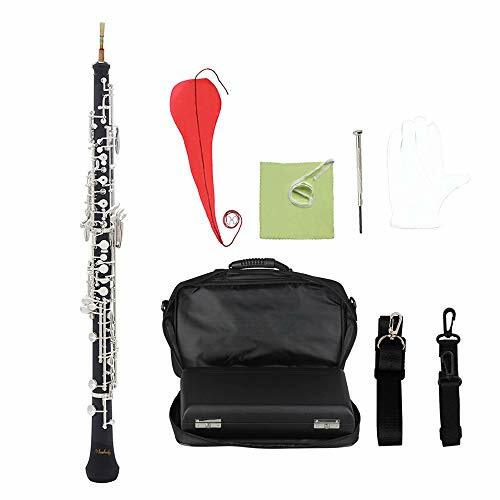 Exquisite Workmanship: High-quality oboe made of black bakelite, with silver plated keys. Ideal Music Gift: C key and semi-automatic style, ideal for beginners, students and professionals. Good Sound: A perfect solo instrument with rich timbre, having a bright and penetrating voice. Easy to Store: Soft wood connection parts for easy assembly and good air tightness. Comes with a leather case and a carry bag for convenient storage and carrying. Suitable for: Commonly used in concert bands, orchestras, chamber music, film music, etc.